A range of evidence-based training programs are available that cater for a variety of educational needs. A general introduction to mental health awareness and suicide prevention to include an awareness of the regional issues, an outline of basic mental health and suicide prevention knowledge with an aim of stigma reduction and communication promotion. 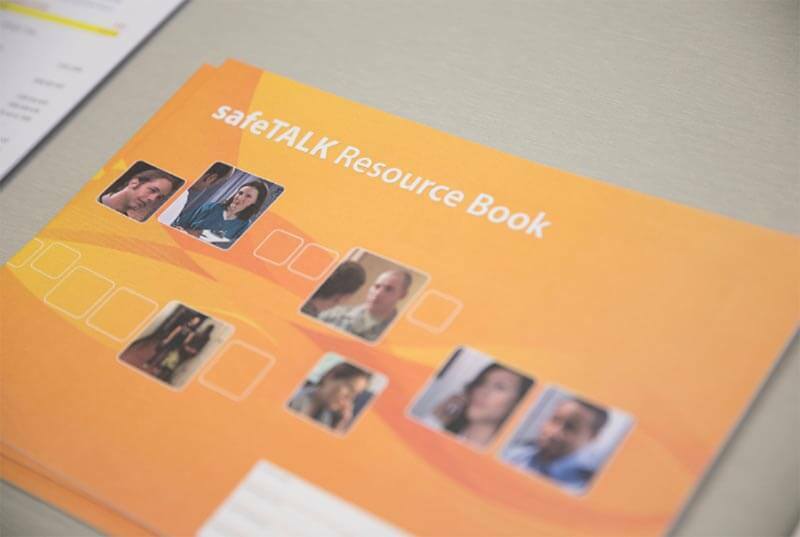 safeTALK is a suicide alertness training program that teaches you to recognise persons with thoughts of suicide and to connect them to suicide intervention resources. Learn to apply a suicide intervention model. It helps you recognise when someone may be at risk of suicide. It then explores how to connect with them in ways that understand and clarify that risk, increase their immediate safety and link them with further help. Mental Health First Aid provides education on the signs and symptoms of common and disabling mental health problems in adults, how to provide initial help, where and how to get professional help, what sort of help has been shown by research to be effective, and how to provide first aid in a crisis situation. Your staff are well placed to notice when their colleagues are not coping, but would they know what to do? Give your staff the skills to recognise the warning signs of suicide and confidence to help that person with suicide prevention training. A number of mental health and suicide prevention training programs are currently available, servicing varying levels of knowledge, skills, and resultant responsibility. Recently, a small number of research‐based training initiatives have targeted industry, with successful results (most notably Mates In Construction; Gullestrup, Lequertier & Martin, 2011). It has been estimated that for every one dollar invested in a workplace suicide prevention strategy would result in a benefit in excess of $1.50, representing a positive economic benefit (Kinchin & Doran, 2017). To date there is limited research observing the impact of an organisation wide multi‐level mental health and suicide prevention strategy in other industries outside of construction. Your organisation has an opportunity to contribute collaboratively to an evidence‐base of research for suicide prevention for our region, by our region. Mental health and suicide prevention training programs will be offered to the community through the Alliance and other community based groups.